The stage at Webster Hall was set for a cinematic show before the band even began to play, with a backdrop of nine, opened gold umbrellas and rows of filament bulbs hanging back in the shadows. After a calm, classical intro, Kazu Makino, in a crisp white mini dress, doll-like, with chaste bow at the waist, stepped out and took hold of a glossy sci-fi white mask with cascading white horse hair spilling from its eyes, hovering near her keyboard, and placed it over her face. 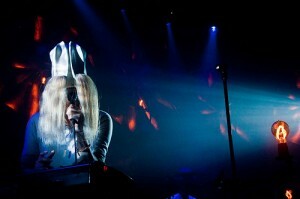 It was just one of the theatrical touches (albeit the mask akin to Fever Ray) that elevated this show into something more than a rock performance. Perhaps the all white clothing and the symbolic mask was a nod to the album Penny Sparkle, with its tales of memory, secrets, love and loss, or desire for new beginnings. The two gents of the trio, Amedeo and Simone Pace, and a touring keyboardist, soon took their places, also clad in white, opening the set with the somber “Black Guitar”, filling the vast space with Amedeo’s slow burn of guitar and Makino’s intimate vocals. Blonde Redhead live and breathe their music. They captivate their audience as soon as they hit the first note and command an allure of mystery that’s rare for a rock band. Their musicianship is spot on and the show flows symphonically, the music comforting yet mournful, played like a modern requiem. Though they’ve worked on expanding and evolving the layers of their songs over the years (classic “In Particular” was a highlight tonight with Makino’s voice almost desperate at certain points, matching the angrier notes of Amedeo’s guitar), Blonde Redhead’s live sound never becomes too precious since it still has a rawness. The audience is pulled in by its emotional core, with the band able to conjure and release various feelings at once.